The rumors started last year. 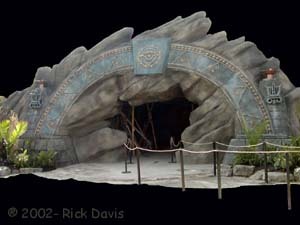 PKI was building a new darkride. The rumors flew on the internet. What would it be? An indoor coaster? A Disney style darkride? A "twirl and hurl"? An extravagant walkthrough? One thing was for sure. PKI remained tight lipped about it and was offering no clues. When DAFE queried PKI with questions, some were answered, most were not. Is it a roller coaster? No. 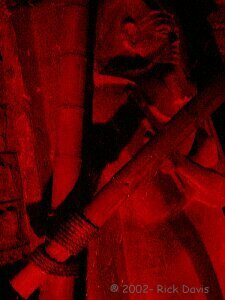 Is it a darkride in the traditional sense? It has darkride features. Is it similar to Disney's Indiana Jones TM . No comment. What IS it? It is the first of its kind in the US. Well, that told us a lot! Where were the clues? 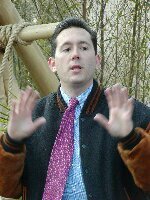 An industry publication which discussed the forthcoming ride mentioned stepping into a coaster car to escape. That was a red herring. All we knew was that the attraction would incorporate props from the Tomb Raider motion picture and that it was designed to be a 20-minute (add booming voice here) "totally immersive DARKRIDE ADVENTURE!" 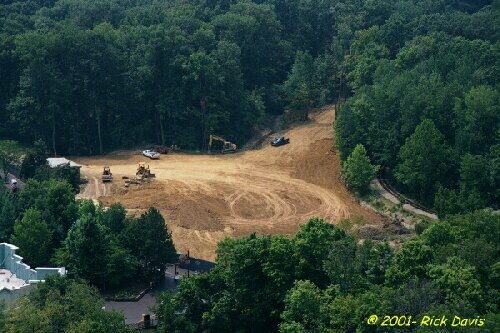 For the next several months, PKI would slowly release photos of the site being prepared, carefully avoiding any photos of the ride mechanism itself. The rumors continued and DAFE continued to try to get more information. The most popular Internet rumor was that the ride would be a Huss Top Spin. Spend a fortune in advertising hype and construction to put a standard ride in the dark? No way! Time passed slowly with each new news release that failed to give any hard information on the ride. There were no calls to DAFE offering a sneak peek, much to our chagrin. We would wait like everyone else and have to see for ourselves when the ride opened. A surprise greeted all of the fans that asked to be put on the news update email list. About a week before the opening day we were told about an ebay auction offering the "first" rides on Tomb Raider. (Not quite true since the media and local radio station contest winners ride it first.) Seventy-seven seats were up for bid. PKI donated the first 77 rides and park admissions to a charity named the Adventures For Wish Kids, a not-for-profit group. (See side bar.) The auctions began and the week passed very slowly as bidders watched carefully to see if they would be out bid. Some folks were lucky and got their tickets for their opening bids of $25. The rest of us were not so lucky. As the earlier auctions closed those that hadn't bid yet, or that were out bid, descended on the remaining auctions. As each successive auction ended, fewer seats were left and the bidding became frantic. Bids were placed with mere seconds left. The bids climbed higher as each auction closed. The final seat sold for $255! Of course the real winners in this auction were the children. 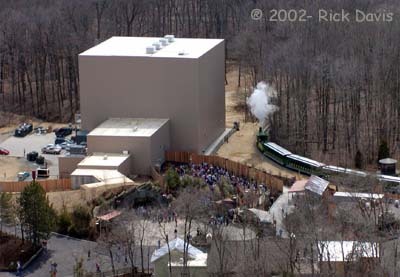 Seventy-seven very happy people would gather one cold Friday morning on April 5, 2002 to experience the long awaited opening of Tomb Raider: the Ride. The excited group was greeted by Jeffery Damron from Adventures For Wish Kids. We were each checked off of the list of winners as we arrived and given a T-shirt. 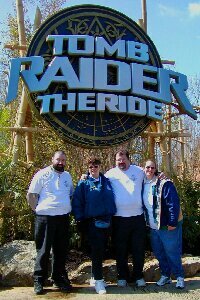 Once everyone had arrived and was accounted for, Jeff Siebert, marketing communications area manager at PKI, gathered the group for the trek through the park to Tomb Raider: the Ride and the first official public ride. DAFE members Keith Schwarz, Sarah Windisch, Sue and Rick Davis were among the winning bidders. While waiting for the last minute checks of the ride system we learned a little bit about the mission of Adventures For Wish Kids and then Jeff Siebert explained a little about the ride. It consists of four rooms: The final room being the actual ride. 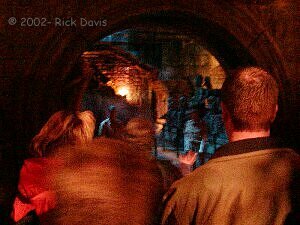 It is a "twenty minute, totally immersive ...darkride adventure!" There is a possibility that you may get wet. Normally, no carryon items are allowed in the ride and the park has lockers available for rent at the ride. But, for this occasion ONLY, cameras would be allowed in the first three "chambers" of the ride, but absolutely no photos of the actual ride itself would be allowed. 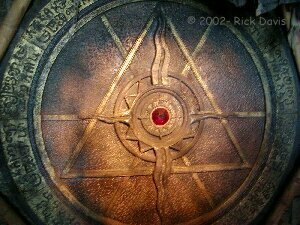 Soon it was time and we were ushered into the attraction. 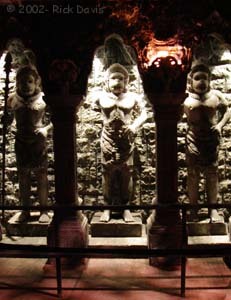 The first room was a narrow elevated pathway through ruins of the tomb. At the end of this room was the first place where the riders are separated into groups. A group of approximately 77 riders are ushered into the next chamber. After a short wait in this area the "vault door" rolls aside to allow riders to enter the third chamber, and the last chance to take the "chicken exit" out of the ride. 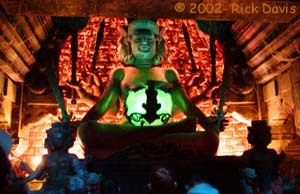 This area contains the large six armed Braham idol, Durga, and several other statues from the movie. 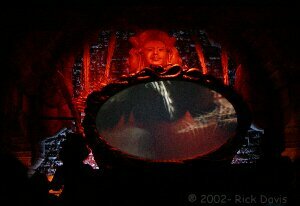 The music comes up and the lights go out and an oval shaped screen appears before the idol showing clips from the Tomb Raider movie. Soon the door opens and we finally approach "the Ride." 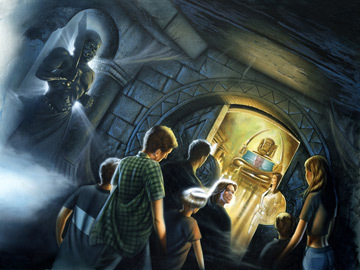 By now many of you have already heard what ride is contained in the final room. For the rest of you, we don't plan to spoil the surprise. I will say this. The ride vehicle itself is basically a standard ride type, although its not likely that you will recognize it for what it really is until the ride is underway. They did an excellent job in camouflaging it. Once everyone is seated, strapped into their seats, and in the dark, the fun begins! The idol appears before you as slowly rise in front of it. Scenes appear and disappear in rapid succession. Stalactites appear menacingly close to your head. 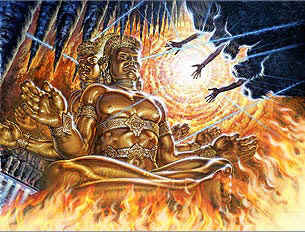 Your head is spinning as you are thrust face first into a bubbling volcano as lava bubbles within inches of your face. Of course there is much more to experience, but like a great movie, it is best not to reveal the surprise ending; you need to see, or ride, it for yourself! 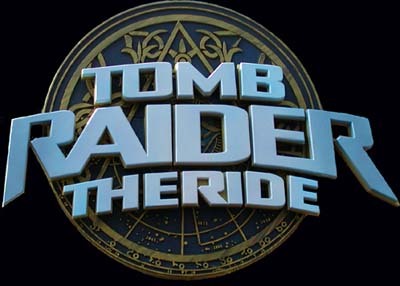 The main question still remains: Is Tomb Raider the Ride a darkride? Ride it, read our definition of a dark ride, and the ride classes, and then drop us a line with your opinion. No matter what kind of ride it is, it is a unique, fun ride, so enjoy it! Photos ©2001-2002 Rick Davis, and used with permission. Art work and on ride photo courtesy of Paramount Kings Island and used with permission.